Click here to visit the LAY’s facebook status and click the play button on their picture. It’s a bit hard to see, but enter your email in the space provided to enter their sweepstakes. 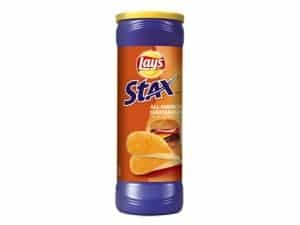 100 winners will score a free LAY’S STAX T-shirt and (1) coupon for a free canister of LAY’S STAX potato crisps. You’ll have until August 9th to enter this one. Winners will be notified by email. Good luck!